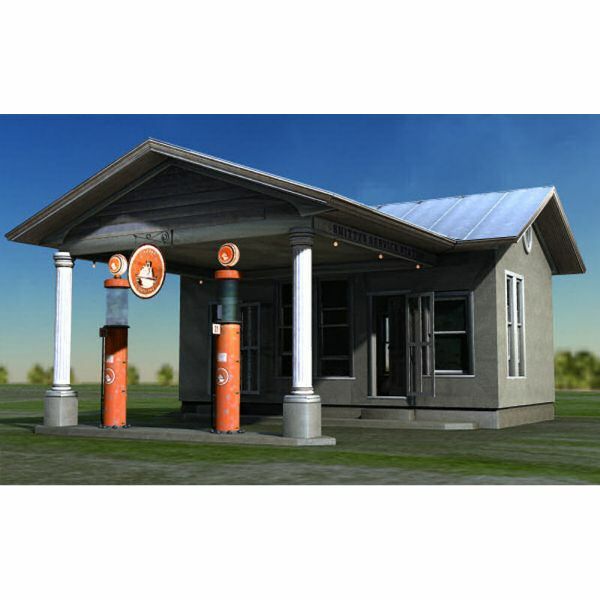 Classic American Gas Station and Environment figure and smart props. This is a scale model of an early twentieth-century automobile service station in Augusta County, Virginia. This model and environment can be easily integrated with Celeste's Diner, available separately. The lighting and background simulates morning on the first day of Spring at that location. For Poser 6 and Poser 7. Each of the fifteen doors, stormdoors and windows can be opened and closed via dials. The fuel levels in the gas pumps can be raised and lowered, and the sign out front can swing in the breeze. Original meshes and unique, historically accurate texture, bump, displacement and opacity maps bring the highway crossroads to life in your artwork. The station branding is customizable: pump and sign logos in red, orange, yellow, green, blue, and white are included and can be selected with a simple materials change. 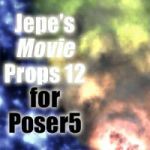 Meshes, uvs, textures, and poser files optimized for efficient rendering and animation. The Service Station and terrain are modeled from real world data and suitable for any scene from 1930 to the present. If you are familiar with Poser shaders, you can alter the materials and make it shiny and new, or rough it up and run it down. The environment may be used for any scenes requiring a stretch of highway: car meets, races, traffic, airport runway, show off the new coupe, stage a gangster shootout, hold up the station, or convert it to an antique shop.